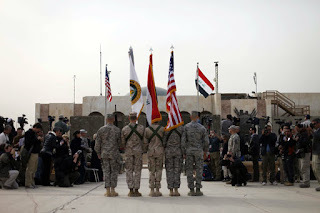 Home » Obama can't say it enough: Iraq war over » US military mission in Iraq on Thursday in Baghdad, Iraq. US military mission in Iraq on Thursday in Baghdad, Iraq. 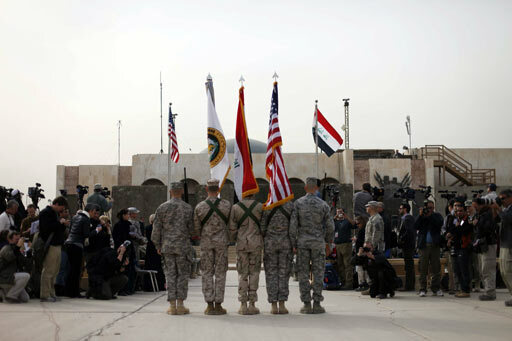 The US flag, Iraq flag, and the US Forces Iraq colors are seen before they are carried in during ceremonies marking the end of US military mission in Iraq on Thursday in Baghdad, Iraq. Every milestone allows him to reach all those voters who opposed the unpopular war, including liberals in his party, whose enthusiasm he must reignite to win a second term. In the last two months, Obama has taken three more swings at it, all of them commanding the attention the White House wanted.